Did you know that Tilghman Island has Water Trails? And the best are visible right from our boat docks. 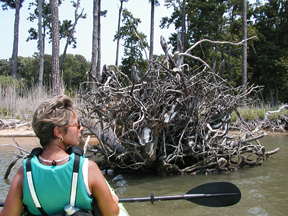 When it comes to kayaking, Tilghman Island Marina has some of the best options available anywhere on the Eastern Shore. Select from Kayak Rentals or Kayak Group Excursions or Corporate Kayaking. See each for details. For 2 or 4 hour Kayak Renters there are 10 local paddling routes mapped out by Maryland's Department of Natural Resources. The best trail is visible from our boat docks, allowing kayakers to see exactly where they are headed by comparing to the trail map. Once launched from our floating dock-ramps, the saltmarsh trails are just paddle strokes away. With its stunning wildlife, sandy beaches and meandering channels (too shallow for powerboats), novice kayakers will feel safe. So pack a lunch and bathing suit for a few leisurely hours of paddling, swimming and relaxing on the sheltered waters of Back Creek Water Trails. The more adventurous Kayak Renters with at least 4 hours available can circumnavigate Tilghman Island skirting the shores of the Choptank River and Chesapeake Bay in search of seaglass and driftwood. They can enjoy a picnic lunch on a sandy beach, swim Bay waters, explore Blackwalnut Cove and tour Dogwood Harbor which is home-port to several historic Sailing Skipjacks. Full day or longer term Kayak Rentals are also available for those who wish to have one at their location. We can deliver or you can pick up. FYI - If you have never kayaked before do not worry; this is a very intuitive and docile sport. Each year we have dozens of first-time kayakers ranging in ages from toddlers to seniors. We provide instruction, trail waters are sheltered and we use ultra-stable & unsinkable Ocean Kayaks. For small groups of 4 to 6 people that are in good physical condition preferring to spend most of their day on the water, a Kayak Excursion is suggested. Choose from any of 3 destination options; Harbor Cove, Waterhole Cove or Blackwalnut Cove. Excursions begin aboard one of our tour boats with kayaks in tow. Once we reach your chosen drop point destination you'll be launched from a beach location to explore the pristine salt-flats, historic estates and farm lands that pepper the shoreline. Then at your own leisurely pace you'll enjoy a scenic paddle back to Tilghman Island Marina with random stops along the way for pictures, picnic lunch and swimming from one of the many remote sandy beaches. FYI - Kayak Group Excursions require 4 to 6 people per group and advance reservations. Allow 5 to 7 hours for your outing. Due to the nature of the excursions, everyone must be in good physical condition in order to safely complete the 6 to 16 mile paddle. Take a scenic boat ride, then kayak back ... Awesome! Kayaking is great for Team and Relationship Building! 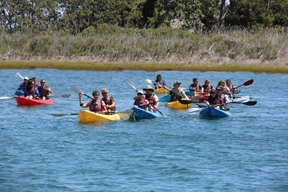 For large groups of 10 or more which includes schools, scouts, corporate events, clubs, family picnics and team-building activities, we can host your gathering at our location providing access to most marina facilities or we can bring our kayak fleet to your waterfront location for a day or more. Large groups kayaking from our location can also reserve usage of the Tilghman Island Marina's facilities which includes use of deck, picnic tables, BBQ grill and bathroom facilities with showers and changing area. 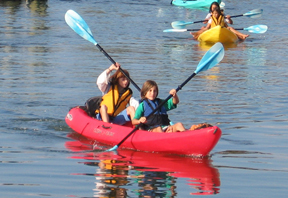 Additionally, those not interested in kayaking can rent any of our other outdoor recreational equipment. I.e., Stand-up Paddle Boards, Canoes, Bikes, WaveRunners, Power Boats, etc. For large groups wanting kayaks at their location, we'll pack our fleet up and bring it to you. We can then remain as your onsite safety monitor assisting kayakers with instruction, life jacket fittings, paddles, launching and retrieving or you can designate your own. FYI - It is highly recommended that Kayak Group Coordinators contact us as far in advance as possible to ensure that our equipment is available on your date.